‘Wild Nights’ opens with a pair of upbeat tracks that are illustrative of the album’s title. ‘Baby Bhangs’ is immediately catchy with its overdriven guitar riff and rapid-fire rhyming couplets: “Downstairs, unaware / Well I never, is this forever? / Chain-smoking, never-ending / Love-lusting, it’s disgusting”. The openly rebellious recent single and Video of the Moment ‘Young Girls’ refuses to be contained in society’s metaphorical box, with lead singer Faith Holgate adamantly declaring “We’re not trying to be brave / We don’t want to be saved”. Two quasi-ballads, ‘Got It Bad’ and ‘Everyone Says’, are as close to heart-on-sleeve love songs as these cool, devil-may-care ladies ever get, and while earnest, they both feel slightly awkward and out of character. PINS are stronger and more confident on darker tracks ‘Oh Lord’ and early single ‘Too Little Too Late’, which delve into sexual innuendo and romance gone wrong, while ‘House of Love’ explores the seamy side of the band’s native Manchester. But by the time I heard Holgate intone the eponymous line “you get so bored in the house of love”, I was indeed becoming a bit dispirited by the album’s steady offering of square melodies and repetitive lyrics. Standout track and current single ‘Molly’ redeems the second half of the album, with an immediately hypnotic, serpentine guitar riff and crisp lyrical couplets in the verse (“Wild nights, with money, she’s got a hold on me”) that inspired the album’s title. More importantly, the song evolves around the halfway point into something almost improvisatory, its instrumental bridge section showing the only brief hint of unrestrained melodic progression on the entire record. For all its emotional and thematic variety, ‘Wild Nights’ feels musically somewhat inhibited. The heavy, overdriven guitars are muted and dampened throughout, and the distant, echoing vocal lines feel emotionally detached, even standoffish. The album’s post-punk nonchalance is carefully and deliberately crafted but its energy occasionally drags, as if perhaps one too many wild nights have begun to catch up with the Mancunian quartet. However, the recent addition of keyboard player Kyoko Swan may add a needed jolt of intensity to PINS’ live sound as they hit the road in support of the new album. 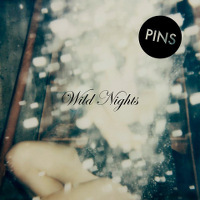 PINS’ sophomore album ‘Wild Nights’ is out now on Bella Union. PINS will support the album release with live tour dates in America this summer and a September headline tour of the UK. Previous TGTF coverage of PINS can be found here.